This is my husband’s favorite salad. He doesn’t cook much (other than summer BBQ dishes) but he has learned to make this one and he makes it quite often for himself. It never lasts long in this house! 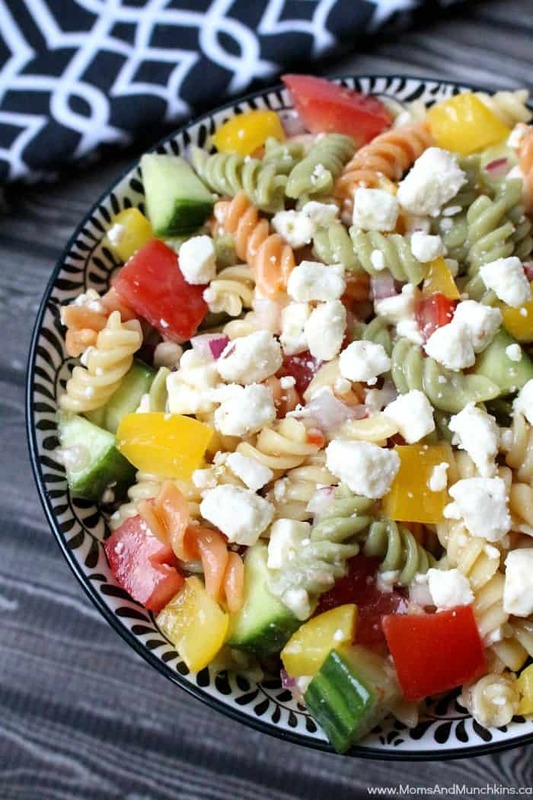 This Greek Pasta Salad is a delicious way to eat your vegetables. Make this with whole wheat pasta and you’ll have a healthy family meal. My favorite part is the feta cheese so I always make sure to put extra on mine. This is one of my husband's favorite side dishes. This is best when made a night before so the ingredients have time to marinate together. Prepare pasta as indicated on box. While pasta is cooking, dice green pepper, red pepper and onion. Place vegetables into large bowl and top with salad dressing, lemon juice and pepper. Stir to mix. Once pasta is done cooking, drain then rinse in cold water until the pasta is cool. Add pasta to the vegetable mixture and stir to mix. Add feta cheese and stir to mix. Let sit in fridge for at least 2 hours (best if made the night before). For more delicious recipes, check out our special Recipes page. We have more appetizers, main dishes and lots of tasty desserts. Since I write a lot about parties on Moms & Munchkins, many of our recipes are perfect for parties and entertaining. Since I love desserts so much, you’ll find plenty of dessert ideas on our recipes page. To stay updated on all the recipes and family fun ideas, follow us on on Facebook, Twitter, Pinterest or our new RSS feed Bloglovin’. looks like a yummy brunch recipe! This sounds delicious, I will have to make this for my family. Depending on appetites, I would say 6.